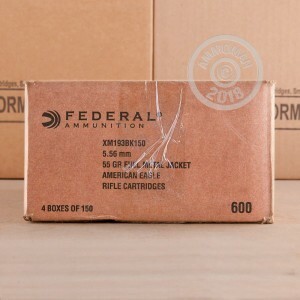 This 600-round case of mil-spec ammunition is highly sought-after Lake City production made in the same facility that supplies the US military. 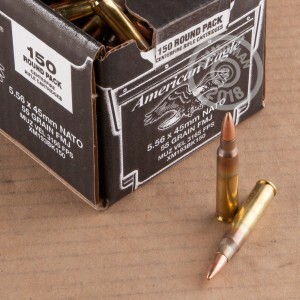 These 5.56 NATO cartridges follow the M193 specification, firing a 55 grain full metal jacket bullet at a muzzle velocity of 3,240 feet per second. The bullet is boat tailed for improved extended-range ballistics. Federal Premium Ammunition, a division of Vista Outdoor, operates the Lake City Army Ammunition plant for the US government. Lake City ammo uses non-corrosive Boxer primers and reloadable brass cases with visible annealing marks. 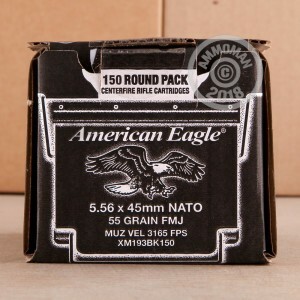 Grab this case or any other ammo totaling $99 or more to get free shipping from AmmoMan.com! Great ammo. Shot one inch groups at 200 yds. Reasonably priced, exceptional customer service. Ammo was delivered sooner then anticipated. Recommend to anyone!!! !